Announcement: After a continuous run of 56 years, Sunrise ceased publication with the Fall 2007 issue. SUNRISE™ is a forum for sharing thoughts and experiences that help in meeting the challenges of daily life. Exploring the fundamental principles and concepts underlying the world's traditions, it presents a wide range of themes in light of ancient and modern theosophy, promoting compassion and brotherhood that arise from the essential unity of all that is. Over 1200 articles from back issues are currently accessible by author and date; many also by subject. Issued from 1951 to 2007, SUNRISE is nonsectarian and nonpolitical. The views expressed by contributors do not necessarily represent those of the magazine or its editors. Questions and comments should be addressed to the Editors. SUNRISE magazine print edition: Back issues: $3.00 each. For more information visit the Sunrise page of the TUP Online Catalog. 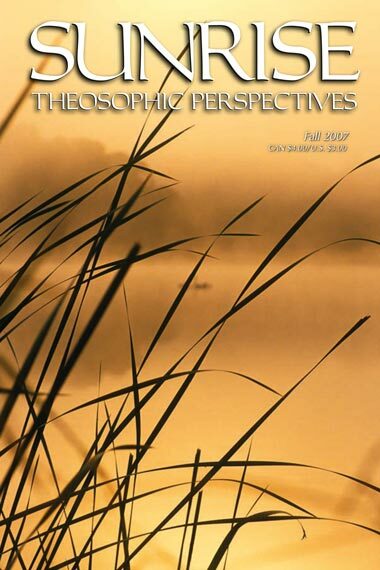 Copyright © 2007 by Theosophical University Press. All rights reserved. Electronic ISSN 1932-653x. Copyrighted material in this site may be downloaded for off-line viewing without charge, but may not be reproduced or transmitted in whole or in part for commercial or other use in any form or by any means — electronic, mechanical, photocopying, recording, or otherwise — without prior permission from Theosophical University Press. For ease of searching, diacritical marks have been removed these online articles. This page updated August 17, 2010.